The autumn has arrived which means that it’s time to get back on track with skincare routine! The keywords for autumn skincare are – moisturizing & nutriating. 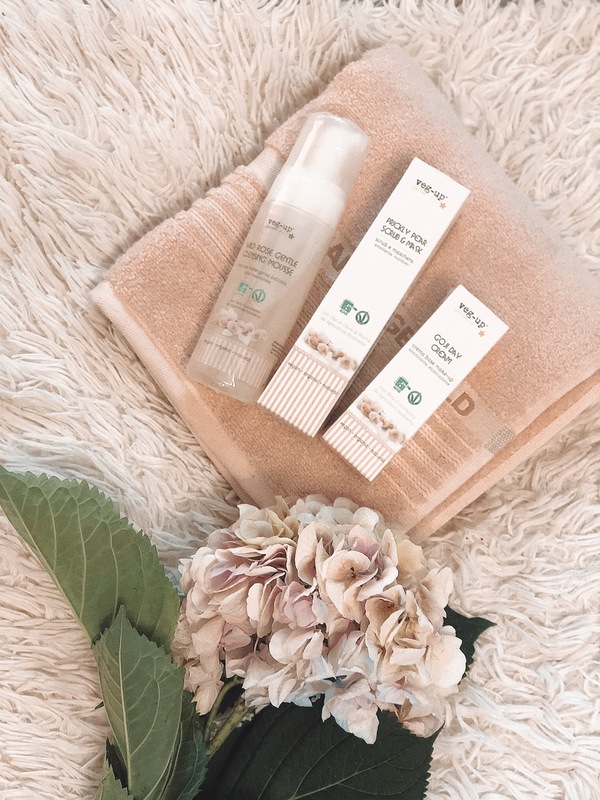 While lighter creams and masks might have done the job previously, getting the hydration your skin needs is even more important now in autumn when the weather cools down. Now there is less sunshine, the weather is chilly and windy, so your skin needs you to turn more attention to it. The key to a beautiful skin is mostly routine and good products. 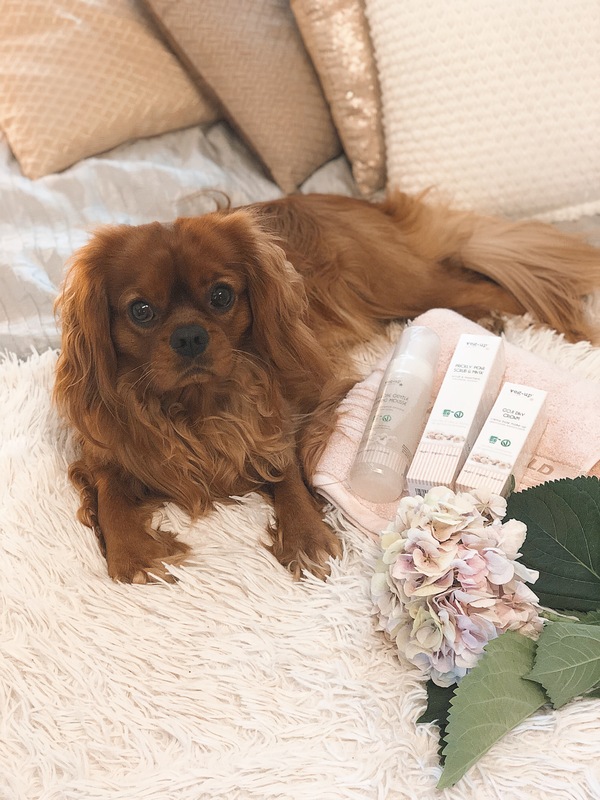 That’s why in today’s blog post we are talking about a 3-step skincare, that gives your skin all it needs for the autumn period and with completely organic products! Regardless of whether you are using makeup or not, the most important beauty treatment is facial cleansing. Skin needs to be cleansed both – in the morning and in the evenings. When cleaning, it’s important that the product you use is effective, but also gentle with your skin. For facial cleansing we recommend our favourite product – Veg-up’s cleansing mousse (Wild rose gentle cleansing mousse). Veg-up’s cleansing mousse has a delicate rose aroma and a very nice texture. This product is suitable for all types of skin, including sensitive skin. Suits around the eyes also! 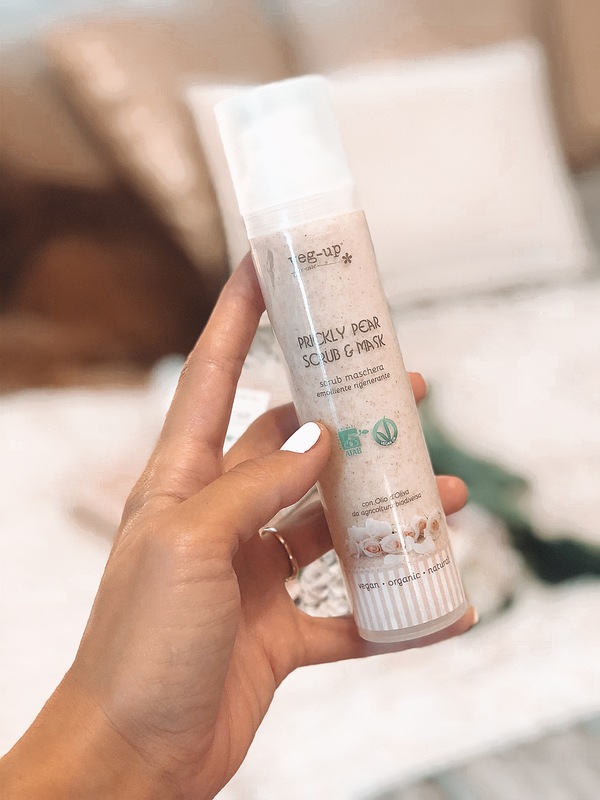 This mousse has both – cleansing and nutritious qualities, since this product contains aloe and rose hip which have moisturizing and antioxidant properties. About packaging – this is biodegradable plastic! Using: Apply mousse on your palm with one or two pump strokes and use circular motions to work it into your skin with your fingertips. Start this at the bottom of your face, and work your way up. Then rinse your skin with water. It’s important that the skin is breathable and bright! So it’s important to get rid of the dead damaged cells. This way, your skin will be prepped to absorb more moisture and improve the effectiveness of nourishing products. Veg-up has made our life easy with one great product that is 2in1, a scrub and a mask in one! Veg-up’s Prickly pear scrub and mask stimulates circulation, removes the dead damaged cells and moisturizes skin deeply at the same time. And the aroma of this product is A M A Z I N G! Every component of this mask has its own important functional contribution. The Prickly Pear is rich in vitamin E and Omega 3,6,9, with antioxidant, regenerative and moisturizing properties. Almond and Argan Oil gives nutrients and leaves the skin shiny and revitalized. Chamomile, calendula extracts and rice starch, soothe and protect the skin. Using: Apply the product with circular movements on the skin and continue the massage until the product has been whipped white on the skin. Then leave the mask on for 10 minutes (little hint! 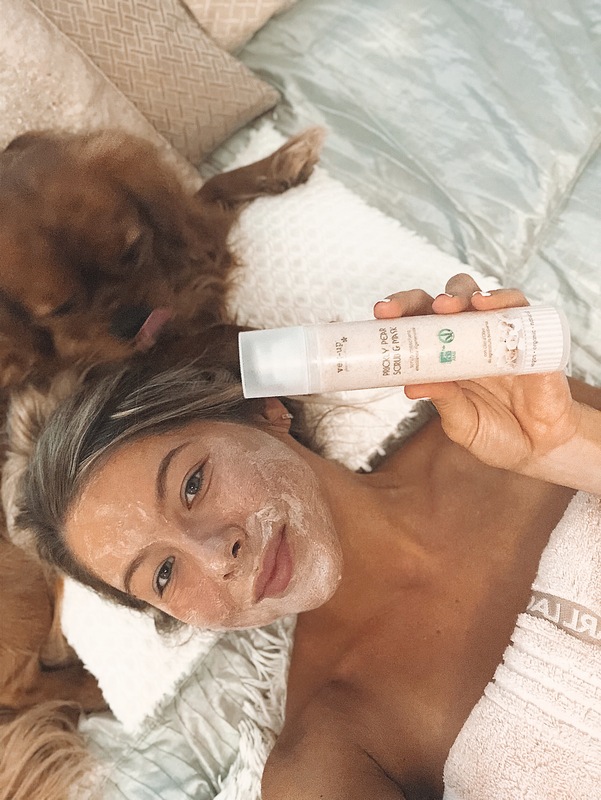 At the same time while the mask is doing its job on your skin, it’s an ideal free moment to snuggle with your pet or baby!). Rinse the mask, dry the skin and enjoy this shine on your skin! In the autumn, it’s important to use a nutritious and moisturizing face cream. As there is less sunshine, then the face cream should contain the vitamin C. Regardless of the type of skin, it should be moistened regularly so that the skin would be healthy and resistant to environmental influences. 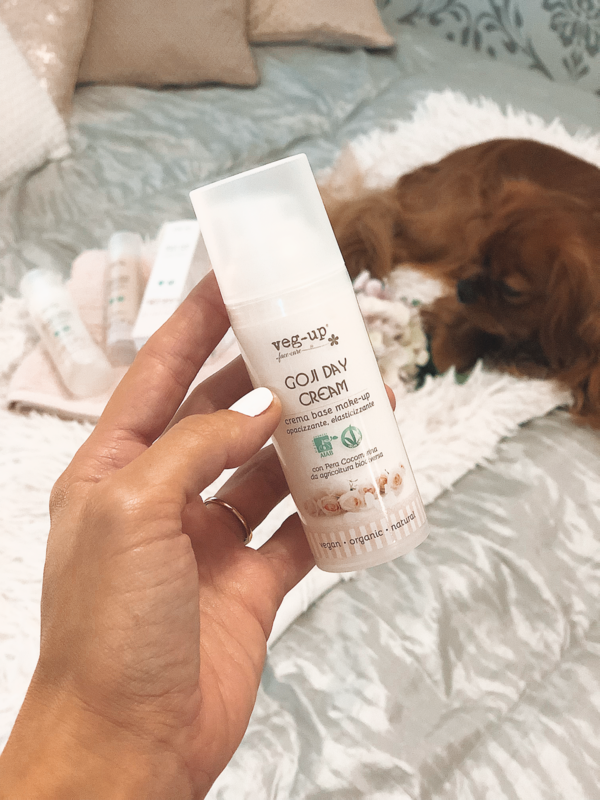 In the autumn the perfect cream would be Veg-up’s Goji day cream, as it contains the vitamin C, which has an important role in the production of collagen and elastin in the skin, which makes the skin more elastic. The almond oil, argan oil and shea butter give to the product nourishing action, gradually minimizing wrinkles. The micronised silica ensures the matting effect and it’s ideal as a base of make-up. So it can also be used as a primer. Again 2in1, great! Enjoy the result! The skin is breathing, looks shiny and smooth! NB! 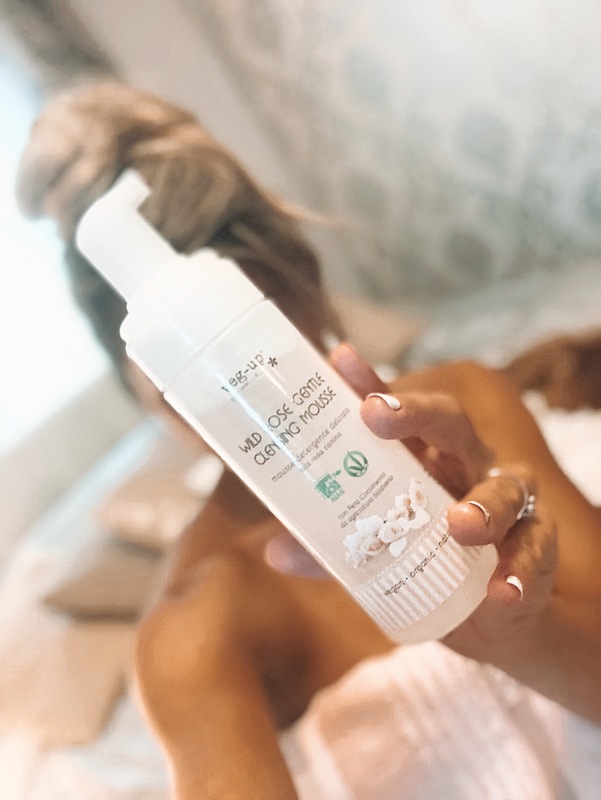 All of the Veg-up products mentioned here are smartly designed (with vacuum, so that the bottom of the package rises when the product decreases), so you can use the product till the last drop!